The Princess Bride is a 1987 American romantic comedy fantasy adventure film directed and co-produced by Rob Reiner, starring Cary Elwes, Robin Wright, Mandy Patinkin, Chris Sarandon, Wallace Shawn, André the Giant and Christopher Guest. Adapted by William Goldman from his 1973 novel of the same name, it tells the story of a farmhand named Westley, accompanied by companions befriended along the way, who must rescue his true love Princess Buttercup from the odious Prince Humperdinck. The film effectively preserves the novel's narrative style by presenting the story as a book being read by a grandfather (Peter Falk) to his sick grandson (Fred Savage). The film was first released in the United States on September 25, 1987, and was well-received by critics at the time, but was only a modest box office success. Over time, particularly with the introduction of the Internet, the film has become a cult classic. The film is number 50 on Bravo's "100 Funniest Movies", number 88 on The American Film Institute's (AFI) "AFI's 100 Years...100 Passions" list of the 100 greatest film love stories, and 46 in Channel 4's 50 Greatest Comedy Films list. In 2016, the film was inducted into the National Film Registry, being deemed as "culturally, historically or aesthetically significant". The film is an enactment of a book read to a sick boy from Chicago—who is initially dismissive of the story—by his grandfather, with occasional interruptions of the scenes in this frame story. A beautiful young woman named Buttercup lives on a farm in the fictional country of Florin. Whenever she orders the farmhand Westley to do chores for her, he complies and answers, "As you wish". She eventually realizes that they are mutually in love. He leaves to seek his fortune so they can marry, but his ship is attacked by the Dread Pirate Roberts and Westley is believed dead. Five years later, Buttercup reluctantly agrees to marry Prince Humperdinck, heir to the throne of Florin. Before the wedding, she is kidnapped by three outlaws: a short Sicilian boss named Vizzini, a gigantic wrestler from Greenland named Fezzik, and a Spanish fencing master named Inigo Montoya, who seeks revenge against a six-fingered man who killed his father. The outlaws are pursued separately by a masked man in black and Prince Humperdinck with a complement of soldiers. The man in black catches up to the outlaws at the top of the Cliffs of Insanity. He defeats Inigo in a duel and knocks him unconscious, chokes Fezzik until he passes out, and kills Vizzini by tricking him into drinking poison. He takes Buttercup prisoner and they flee, stopping to rest at the edge of a gorge. When Buttercup correctly guesses that he is the Dread Pirate Roberts, she becomes enraged at him for killing Westley; distracted when Humperdinck and his men appear in the distance, she shoves him down the hill into the gorge and wishes death upon him. As he tumbles down, he shouts, "As you wish!" Realizing he is Westley, she throws herself into the gorge after him and they are reunited. Westley explains the Dread Pirate Roberts is actually a title passed on by subsequent holders and he had taken the title so the previous Roberts could retire. They pass through the dangerous Fire Swamp inhabited by rodents of unusual size, (ROUS) but are captured on the other side by Humperdinck and his sadistic vizier Count Rugen, who is revealed to be Inigo's father's killer. Buttercup agrees to return with Humperdinck in exchange for Westley's release, but Humperdinck secretly orders Rugen to lock Westley in his torture chamber, the Pit of Despair. When Buttercup expresses unhappiness at marrying Humperdinck, he promises to search for Westley. However, his real plan is to start a war with the neighboring country of Guilder by killing Buttercup and framing Guilder for her death (he had hired Vizzini to kill her for that same purpose). Meanwhile, Inigo and Fezzik reunite when Humperdinck orders the thieves arrested in the nearby forest, and Fezzik tells Inigo about Rugen. Inigo decides that they need Westley's help to get into the castle. Buttercup berates Humperdinck after learning that he never tried to find Westley; enraged, Humperdinck imprisons Buttercup in her chambers, and tortures Westley to death. Inigo and Fezzik follow the cries of anguish through the forest. They find Westley's body and bring him to a folk healer, Miracle Max, who Humperdinck had recently fired. He discovers that Westley is only "mostly dead" due to being sustained by his love for Buttercup, and revives him to a state of heavy paralysis. After Westley, Inigo, and Fezzik invade the castle, Humperdinck panics and orders the wedding ceremony shortened. Inigo finds and kills Rugen in a duel, repeatedly taunting him with his greeting of vengeance: "Hello, my name is Inigo Montoya. You killed my father. Prepare to die." Westley finds Buttercup, who is about to commit suicide, assuring her that the marriage is invalid because she never said "I do". Still partly paralyzed, he bluffs his way out of a duel with Humperdinck and they flee the castle. Westley rides away with Buttercup, Inigo, and Fezzik before sharing a passionate kiss with Buttercup. Back in the boy's bedroom, the boy eagerly asks his grandfather to read the story to him again the next day, to which the grandfather replies, "As you wish". Rob Reiner, who had been enamored with Goldman's book ever since he was given it as a gift from his father Carl Reiner, realized he wanted to make the film adaptation after successfully demonstrating his filmmaking skill with the release of This Is Spinal Tap in 1984. 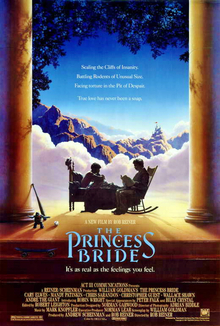 During production of Stand by Me, released in 1986, Reiner had spoken to an executive at Paramount Pictures regarding what his next film would be, and suggested the adaptation of The Princess Bride. He was told they couldn't do that, leading Reiner to discover that several studios had previously attempted to bring Goldman's book to the big screen without success. Among those previous attempts include 20th Century Fox, which paid Goldman $500,000 for the film rights and to do a screenplay in 1973. Richard Lester was signed to direct and the movie was almost made, but the head of production at Fox was fired and the project was put on hiatus. Goldman subsequently bought back the film rights to the novel with his own money. Other directors had also attempted to adapt the book, including Francois Truffaut, Robert Redford and Norman Jewison, and at one point, Christopher Reeve was interested in playing Westley in one planned adaption. However, Reiner had found success by gaining financial support from Norman Lear, who Reiner knew from All in the Family and who had funded production of This is Spinal Tap, with the production to be distributed by 20th Century Fox. Reiner worked closely with Goldman to adapt the book for the screenplay. Reiner had quickly decided on Cary Elwes for Westley, based on his performance in Lady Jane. However, during the casting period in Los Angeles, Elwes was in Germany on set for Maschenka. Reiner flew out to Munich to meet with Elwes, confirming his appropriateness for the role. While Reiner and casting director Jane Jenkins auditioned other actors for Westley, they knew Elwes was perfect for the part. Elwes himself had read the book in his childhood and associated himself with the character of Westley, but never believed he would have the opportunity to play him. Robin Wright was cast late in the process, about a week prior to the start of filming; Reiner and Jenkins had auditioned a number of English actresses but had not found their ideal Buttercup. Wright's agent had heard of the casting call and encouraged Wright to audition. Though initially shy, Wright impressed Jenkins, and later Reiner. They invited Wright to come meet Goldman at his house. Jenkins recalls: "The doorbell rang. Rob went to the door, and literally, as he opened the door, [Wright] was standing there in this little white summer dress, with her long blonde hair, and she had a halo from the sun. She was backlit by God. And Bill Goldman looked across the room at her, and he said, 'Well, that's what I wrote.' It was the most perfect thing." Mandy Patinkin and Wallace Shawn were early choices for the cast; Shawn in particular was chosen as Vizzini due to his diminutive size to contrast that of the giant Fezzik. When Goldman originally shopped his novel in the early 1970s, his first choice for Fezzik was Andre the Giant, whose wrestling schedule left him unavailable for filming. Goldman's second choice was Arnold Schwarzenegger, who at that time was almost unknown as an actor. However, by the time The Princess Bride was finally green-lit, Schwarzenegger was a major film star and the studio could not afford him. Jenkins contacted the World Wrestling Federation to ask about hiring Andre, but were told that the filming conflicted with a wrestling match in Tokyo that would pay him $5 million. Jenkins auditioned other tall men, including Kareem Abdul-Jabbar, Lou Ferrigno and Carel Struycken, but these did not pan out. Near the end of casting, the World Wrestling Federation told Jenkins that Andre's match in Tokyo had been cancelled, clearing him to play the role of Fezzik. 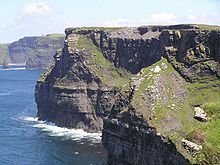 The Cliffs of Insanity are actually the Cliffs of Moher in County Clare, Ireland. The framing story scenes, the last to be filmed, were recorded at Shepperton Studios in Surrey. Reiner rented a house in England near these sites and frequently invited the cast over for meals and light-hearted get-togethers. Many cast members believed this helped to create a sense of "family" that helped to improve their performances for the film. Cary Elwes and Mandy Patinkin learned to fence (both left- and right-handed) for the film, and performed these scenes themselves, outside of the two somersaults which were performed by stunt doubles. They were trained by fencing instructors Bob Anderson and Peter Diamond, both of whom had also worked on training the actors in the original Star Wars trilogy. Elwes and Patinkin spent about three weeks prior to filming learning to fence, and while spending most of their off-camera free time to practice. Anderson encouraged the two to learn the other's choreography for the fight, as to help them anticipate the movements and avoid an accident. They also watched as many sword fights from previous films to see how they could improve on those. Popular professional wrestler André the Giant had undergone major back surgery prior to filming and, despite his great size and strength, could not support the weight of Cary Elwes during their fight scene or Robin Wright for a scene at the end of the film. For the wrestling scene, when Elwes was pretending to hang on André's back, he was actually walking on a series of ramps below the camera during close-ups. For the wide shots, a stunt double took the place of André. When he was apparently carrying Wright, she was actually suspended by cables. Billy Crystal and Carol Kane spent time before traveling to England to work out the backstory between Miracle Max and his wife, and develop a rapport for their characters. Once on set, Reiner allowed the pair to improvise some of their lines. The original soundtrack album was composed by Mark Knopfler, and released by Warner Bros. Records in the United States and Vertigo Records internationally in November 1987. The album contains the song "Storybook Love", performed by Willy DeVille and produced by Mark Knopfler. It was nominated for an Academy Award for Best Original Song at the 60th Academy Awards. In his audio commentary of the film on the special edition DVD, director Rob Reiner said that only Mark Knopfler of Dire Straits could create a soundtrack to capture the film's quirky yet romantic nature. Reiner was an admirer of Knopfler's work but did not know him before working on the film. He sent the script to him hoping he would agree to score the film. Knopfler agreed on one condition: that somewhere in the film Reiner would include the USS Coral Sea (CV-43) baseball cap (which had been modified to say "USS Ooral Sea OV-4B") he wore as Marty DiBergi in This Is Spinal Tap. Reiner was unable to produce the original cap, but did include a similar cap in the grandson's room. Knopfler later said he was joking. The film was initially a modest success, grossing $30.8 million at the United States and Canada box office, on a $16 million production budget. The Princess Bride received critical acclaim. On Rotten Tomatoes, the film holds a 97% "Certified Fresh" rating, based on 71 reviews, with an average rating of 8.34/10. The site's consensus states: "A delightfully postmodern fairy tale, The Princess Bride is a deft, intelligent mix of swashbuckling, romance, and comedy that takes an age-old damsel-in-distress story and makes it fresh." On Metacritic, the film holds a score of 77 out of 100, based on 20 critics, indicating "generally favorable reviews." Gene Siskel and Roger Ebert gave the film a "two thumbs up" rating on their television program. Ebert also wrote a very favorable print review in his column for the Chicago Sun-Times.Richard Corliss of Time said the film was fun for the whole family, and later, Time listed the film as one of the "Best of '87". Janet Maslin of The New York Times praised the cast and the sweetness of the film. The Princess Bride was not a major box-office success, but it became a cult classic after its release to the home video market. The film is widely regarded as eminently quotable. Elwes noted in 2017, on the film's 30th anniversary, that fans still frequently come up to him and quote lines from the movie. According to him Wallace Shawn had it "worse", in that any time Wallace made a small error like dropping his keys, people would shout "Inconceivable!" to him. In 2000, readers of Total Film magazine voted The Princess Bride the 38th greatest comedy film of all time. In 2006, William Goldman's screenplay was selected by the Writers Guild of America as the 84th best screenplay of all time; it earned the same ranking in the Guild's 2013 update. The film was selected number 88 on The American Film Institute's (AFI) "AFI's 100 Years... 100 Passions" listing the 100 greatest film love stories of all time. BBC Radio 5's resident film critic, Mark Kermode, is a fan of the film, frequently considering it a model to which similar films aspire.. In December 2011, director Jason Reitman staged a live dramatic reading of The Princess Bride script at the Los Angeles County Museum of Art (LACMA), with Paul Rudd as Westley; Mindy Kaling as Buttercup; Patton Oswalt as Vizzini; Kevin Pollak as Miracle Max; Goran Visnjic as Inigo Montoya; Cary Elwes (switching roles) as Humperdinck; director Rob Reiner as the grandfather; and Fred Savage reprising his role as the grandson. In 2013, director Ari Folman released a live-action animated film titled The Congress, which directly referenced The Princess Bride. Folman's film starred Robin Wright, playing both a live and animated version of herself, as a digitally cloned actress. In 2014, Cary Elwes wrote As You Wish: Inconceivable Tales From the Making of The Princess Bride, a behind-the-scenes account of the film's production, co-written with Joe Layden. To help Elwes recall the production, Lear sent him a bound copy of the filming's call sheets. The book debuted at #3 on the New York Times Bestseller list. In addition to a foreword by director Rob Reiner and a limited edition poster, the book includes exclusive photos and interviews with the cast members from the 25th anniversary cast reunion, as well as unique stories and set secrets from the making of the film. In 2018, Savage reprised his role as The Grandson in a PG-13 version of Deadpool 2 entitled Once Upon a Deadpool, with Deadpool taking the role of The Narrator and reading the Deadpool 2's story to him at bedtime and skipping over the more adult parts from the R-rated version. In North America, the film was released on VHS and Laserdisc in 1988 by Nelson Entertainment, the latter being a "bare bones" release in unmatted full screen. New Line Home Video reissued the VHS in 1994. The film was also released on Video CD by Philips. The Criterion Collection released a matted widescreen version, bare bones version on laserdisc in 1989, supplementing it with liner notes. In 1997 Criterion re-released the Laserdisc as a "special edition". This edition was widescreen and included an audio commentary by Rob Reiner, William Goldman, Andrew Scheinman, Billy Crystal and Peter Falk (this commentary would also later appear on the Criterion Blu-ray and DVD release); excerpts from the novel read by Rob Reiner; behind the scenes footage; a production scrapbook by unit photographer Clive Coote; design sketches by production designer Norman Garwood; and excerpts from the television series Morton and Hayes, directed by Christopher Guest. By 2000, MGM had acquired the US home video rights to the film (as part of the "pre-1996 Polygram film library" package) and released the film on VHS and DVD. The DVD release featured the soundtrack remastered in Dolby Digital 5.1 with the film in wide and full screen versions, and included the original US theatrical trailer. The next year MGM re-released the film in another widescreen "special edition", this time with two audio commentaries—one by Rob Reiner, the other by William Goldman—"As You Wish", "Promotional", and "Making Of" featurettes;[clarification needed] a "Cary Elwes Video Diary"; the US and UK theatrical trailers; four television spots; a photo gallery; and a collectible booklet. In 2006, MGM and Sony Pictures Home Entertainment released a two-disc set with varying covers—the "Dread Pirate" and "Buttercup" editions. Each featured their respective character, but had identical features: in addition to the features in the previous release were, the "Dread Pirate Roberts: Greatest Legend of the Seven Seas", "Love is Like a Storybook Story", and "Miraculous Make Up" featurettes, "The Quotable Battle of Wits" game, and Fezzik's "Guide to Florin" booklet. Another year later, to commemorate the 20th anniversary of the film, MGM and 20th Century Fox Home Entertainment (whose corporate parent The Walt Disney Company now holds all US rights to the film except for US home video rights) released the film with flippable cover art featuring the title displayed in an ambigram. This DVD did not include any of the bonus features from the older editions, but had new short featurettes and a new game. A Blu-ray Disc was released on March 17, 2009, encoded in 5.1 DTS-HD Master Audio. Special features include two audio commentaries, the original theatrical trailer and eight featurettes. In 2007, the film was released for download in the iTunes Store. The film is also available in Region 2 where it is published by Lions Gate Entertainment. Its extras are the theatrical trailer and text filmographies. The Criterion Collection released the film on Blu-ray and DVD on October 30, 2018. It included a new 4K digital transfer, the same audio commentary from the Criterion LaserDisc release, an edited 1987 audiobook reading of Goldman's novel by director Rob Reiner, new programs on William Goldman's screenplay and tapestry, a new interview with art director Richard Holland, an essay by author Sloane Crosley, and a Blu-ray exclusive book highlighting four screenplays, as well as Goldman's introduction to the 1995 screenplay. It was announced that composer Adam Guettel was working with William Goldman on a musical adaptation of The Princess Bride in 2006. The project was abandoned in February 2007 after Goldman reportedly demanded 75 percent of the author's share, even though Guettel was writing both the music and the lyrics. In late 2013, Disney Theatrical Productions announced that they would adapt a stage musical adaptation of The Princess Bride. A website was launched a couple of months later. In 2016, Rob Reiner said the project was still in development despite "roadblocks" and that Marc Shaiman, Randy Newman and John Mayer had all been approached to write songs, but had turned them down. In 2018, The Princess Bride was adapted by players of a virtual reality social game, Rec Room, into what is likely to be the world's first full-length virtual reality stage production. The duration of the production was approximately 80 minutes, and ran for a total of four shows. In 2008, PlayRoom Entertainment released The Princess Bride: Storming the Castle, a board game based on the film. The Princess Bride Game is a casual video game developed and published by New York game development studio Worldwide Biggies. ^ a b "The Cast of 'The Princess Bride,' Then and Now"". Hollywood Reporter. Archived from the original on October 22, 2018. ^ "50 Greatest Comedy Films". Channel4.com. Channel 4. January 27, 2010. Archived from the original on November 4, 2011. Retrieved October 30, 2011. ^ "'Lion King,' 'Princess Bride,' 'The Birds' Among Additions To Film Registry". NPR.org. Archived from the original on December 1, 2017. Retrieved December 15, 2016. ^ a b c d e f g h i j k King, Susan (September 24, 2017). "'The Princess Bride' Turns 30: Rob Reiner, Robin Wright, Billy Crystal Dish About Making the Cult Classic". Variety. Archived from the original on December 30, 2017. Retrieved December 29, 2017. ^ Weiler, A. H. (September 30, 1973). "News of the Screen". The New York Times. Archived from the original on December 2, 2017. Retrieved April 17, 2017. ^ "Schlesinger to Direct West Work." Haber, Joyce. Los Angeles Times (1923-Current File) [Los Angeles, Calif] 19 September 1973: d12. ^ a b c d Vineyard, Jennifer (September 29, 2017). "What It Was Like Finding the Legendary Cast of 'The Princess Bride'". Vice. Archived from the original on February 4, 2018. Retrieved December 29, 2017. ^ a b Messer, Leslie (September 25, 2017). "'The Princess Bride' turns 30: Cary Elwes shares stories from the set". ABC News. Archived from the original on December 30, 2017. Retrieved December 29, 2017. ^ Kent Film Office. "Kent Film Office The Princess Bride Film Focus". ^ a b c d Coggan, Devan (October 3, 2017). "Cary Elwes talks sword fights, André the Giant, and The Princess Bride". Entertainment Weekly. Archived from the original on December 30, 2017. Retrieved December 29, 2017. ^ "Wright: 'Giant Was In So Much Pain On The Princess Bride Set'". Contactmusic.com. March 10, 2010. Archived from the original on February 21, 2016. Retrieved October 20, 2015. ^ "The Princess Bride". Allmusic. Archived from the original on November 2, 2011. Retrieved November 23, 2011. ^ "The Princess Bride (1987". Box Office Mojo. Archived from the original on November 4, 2018. Retrieved September 27, 2011. ^ "The Princess Bride (1987)". Rotten Tomatoes. Flixster. Archived from the original on August 30, 2013. Retrieved March 17, 2015. ^ "The Princess Bride". Metacritic. CBS. Archived from the original on October 25, 2012. Retrieved November 14, 2012. ^ "''At the Movies with Gene Siskel and Roger Ebert'' review". Bventertainment.go.com. Archived from the original on April 1, 2007. Retrieved August 5, 2010. ^ Roger Ebert (October 9, 1987). "The Princess Bride". Chicago Sun-Times. Archived from the original on October 12, 2012. Retrieved December 5, 2018. ^ Richard Corliss (September 21, 1987). "Errol Flynn Meets Gunga Din THE PRINCESS BRIDE". Time. Archived from the original on September 30, 2007. Retrieved June 28, 2007. ^ "Best of '87"". Time. January 4, 1988. Archived from the original on October 12, 2007. ^ Janet Maslin (September 25, 1987). "New York Times review". ^ Clarke, Suzan (October 7, 2011). "'Princess Bride' Reunion, Thanks to Entertainment Weekly Magazine". ABC. Archived from the original on October 8, 2011. Retrieved March 9, 2018. ^ "Reelviews Movie Reviews: The Princess Bride". January 4, 2002. Archived from the original on December 9, 2016. Retrieved October 31, 2016. ^ Savage, Sophia (February 27, 2013). "WGA Lists Greatest Screenplays, From 'Casablanca' and 'Godfather' to 'Memento' and 'Notorious'". Writers Guild of America, West. Archived from the original on March 6, 2013. ^ "AFI's 100 Years...100 Laughs Nominees" (PDF). Archived (PDF) from the original on December 20, 2015. Retrieved June 30, 2011. ^ "AFI's 100 Years...100 Movie Quotes Nominees" (PDF). Archived (PDF) from the original on June 28, 2011. Retrieved June 30, 2011. ^ "AFI.com Error" (PDF). afi.com. Archived (PDF) from the original on September 11, 2011. Retrieved June 30, 2011. ^ Breznican, Anthony (December 30, 2011). "'The Princess Bride' Comes Alive!". Entertainment Weekly. Archived from the original on January 15, 2012. Retrieved April 7, 2012. ^ Kelly, Caitlin (October 25, 2014). "The Movie That Won the Internet". The New Yorker. ISSN 0028-792X. Archived from the original on December 30, 2017. Retrieved December 29, 2017. ^ Sneider, Jeff (September 28, 2018). "New 'Deadpool' Movie Coming This December; Will Feature 'Princess Bride' Star Fred Savage". Deadline Hollywood. Archived from the original on September 29, 2018. Retrieved September 30, 2018. ^ Boucher, Geoff (November 5, 2018). "'Once Upon A Deadpool': Ryan Reynolds (and Fred Savage) On Franchise's PG-13 Plunge". Deadline Hollywood. Archived from the original on November 5, 2018. Retrieved November 5, 2018. ^ "CD Films/Music". Sega Saturn Magazine. No. 13. Emap International Limited. November 1996. p. 97. ^ "MGM Press Release: The Princess Bride (Blu-ray)]" (Press release). Archived from the original on February 10, 2009 – via Home Theater Forum. ^ "Itunes – Princess Bride". Archived from the original on June 26, 2013. Retrieved October 31, 2011. ^ "Criterion Announces October Titles". July 16, 2018. Archived from the original on July 17, 2018. Retrieved July 16, 2018. ^ Riedel, Michael (February 16, 2007). "'Bride' Not to Be While Broderick Balks at 'Producers'". New York Post. Archived from the original on February 25, 2007. ^ Champion, Lindsay (November 11, 2013). "Inconceivable! Disney Stage Adaptation of The Princess Bride in the Works". Broadway.com. Archived from the original on March 1, 2018. Retrieved February 28, 2018. ^ Cerasaro, Pat (February 8, 2014). "Disney Launches THE PRINCESS BRIDE Stage Musical Website". Broadway World. Archived from the original on August 19, 2018. Retrieved March 1, 2018. ^ Viagas, Robert; Hetrick, Adam (May 11, 2016). "Rob Reiner Says He Still Wants to See a Princess Bride Stage Musical". Playbill. Archived from the original on March 1, 2018. Retrieved March 1, 2018. ^ Carson, Erin. "The Princess Bride performed live -- in a VR app". CNET. The Orange Bucket Acting Troupe...pulled off what's likely the first full-length play performed in VR. ^ "Orange Bucket Acting Troupe presents: The Princess Bride - A Rec Room Tale". YouTube. October 31, 2018. Retrieved March 11, 2018. ^ "The Princess Bride: Storming the Castle - Board Game - BoardGameGeek". boardgamegeek.com. Archived from the original on November 8, 2008. Retrieved August 18, 2008. ^ Sinclair, Brenden (October 3, 2007). "Princess Bride game conceivable". GameSpot. Archived from the original on May 25, 2011. Retrieved June 3, 2008. ^ McElroy, Justin (October 3, 2007). "As you wish, Princess Bride game in development". Joystiq. Archived from the original on January 28, 2015. Retrieved June 5, 2008. Elwes, Cary; Layden, Joe (2014). As You Wish: Inconceivable Tales from the Making of The Princess Bride. New York: Touchstone. ISBN 9781476764023. OCLC 878812649.